More and more clients are providing MORE access to guests, than corporate users, Meraki works very well when you assume the old way (Open for office users, restricted for guests) which means that you need to do a few things different from the manual or normal. The major benefit here is the flexibility of group policies when you use this method. One of the best things about Meraki is that Guest Wireless is only a few clicks away, typically you use NAT Mode to provide client exclusion, firewall the users from accessing corporate resources, shape the traffic, and then perform content filtering at the edge. The only downfall is – this assumes that your default filter on your firewall is what you want for guests. Unless clients authenticate with active directory, there is no way to assign a policy to them as they are all NAT’d with some random IP address by the access point. 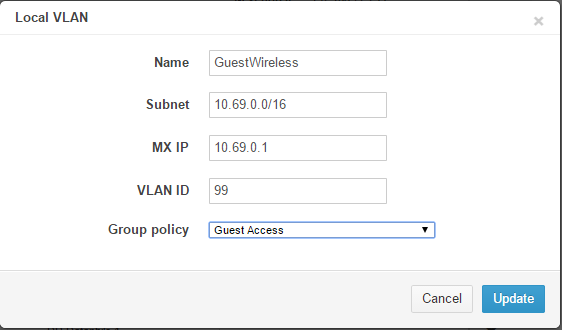 Even using the built in Meraki RADIUS and creating a “guest” account does not allow you to assign a group policy. This is where the Meraki Integration falls over a bit, the extended content filtering capabilities of the security appliance, live on the security appliance. In order for me to filter content (web) I need to get the traffic over there first, in a way that can be identified, and then I can put a content filter on it. It would be easier if I could in some way just tell that SSID — all users on this SSID, have this group policy, but I cannot do that, those policies are a security appliance feature – not wireless. 1) Default Policy – If it does not have a policy, we use this. 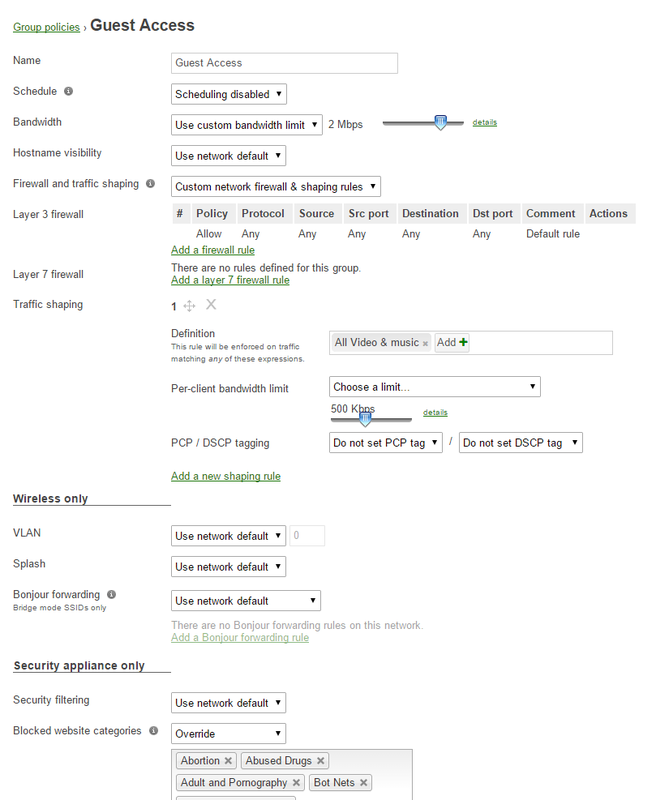 2) AD Authentication – We can assign AD Groups a Meraki Group Policy. The issue is that the very easy to manage NAT MODE which also provides client exclusion – only goes over the default VLAN of the AP – you cannot select which VLAN the SSID is on, if it is in NAT mode. Which means that I’m stuck with default policy for unauthenticated users. This also means no client exclusion. 1) Go into group policies and build your guest policy. This is the real benefit of this method, you can build a policy for guest networks now, along with schedules, shaping and content filtering and it is all visible in this one screen. You can even create flexible filtering based on schedules which you cannot do the other way. 5) You want to DENY all the RFC 1918 (Private) addresses, but ALLOW your default gateway address, and also click “Deny” for the “Local Lan” option. This will prevent users from talking to each other (even on the same AP). If you want some extra shaping, do it below, on guest I like to limit their media streaming to 512K, it provides enough for Youtube SD, but does not allow 1080P streaming. Great post, love Meraki’s simplicity & cloud management. Meraki Systems Manager makes managing guest access even easier, with automated WiFi and device settings. Hi, Great post. Only issue I have is that the web block page won’t show when configured as above. If for example I’m on the guest wifi VLAN and a page is blocked the I’m unable to access the blocked page at wired.meraki.com as this resolves to an ip address of the mx/router in an unaccessible VLAN. Would you have any idea how to get around this? What if you put in a DNS entry that sends it to the default gateway on the correct lan? Try this with your host file first and see if that fixes it. 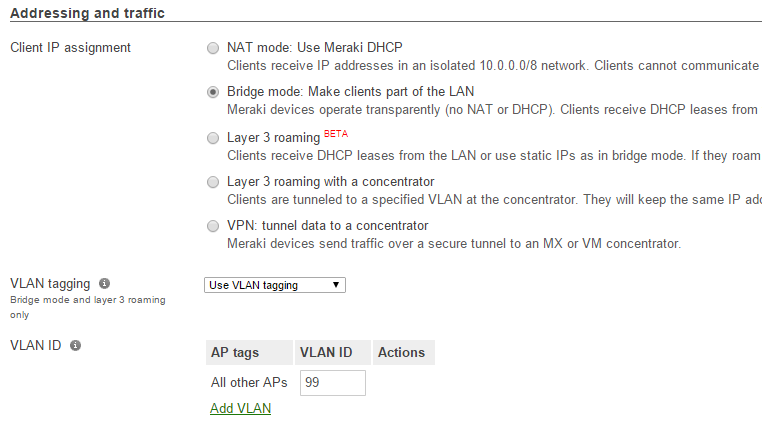 ptp: how to set 1 at a time access in meraki wireless?